The 3DS is not Nintendo's first foray into the world of 3D gaming. In fact, it's not even the company's second. First up was a 3D headset for the good 'ol Famicom (NES in the US), but that never saw American shores and it wasn't anything more fancy than a set of active shutter glasses anyway -- the same sort HDTV manufacturers are trying to sell you today. However, the company's second 3D offering did make it to the US, where it landed with a spectacular thud. It was the Virtual Boy, a 32-bit portable console powered by six whole AA batteries and remembered by many for its ability to inspire more headaches than excitement in the gamers who tried it. It was released in the US in August of 1995 for $180 and was discontinued less than a year later. 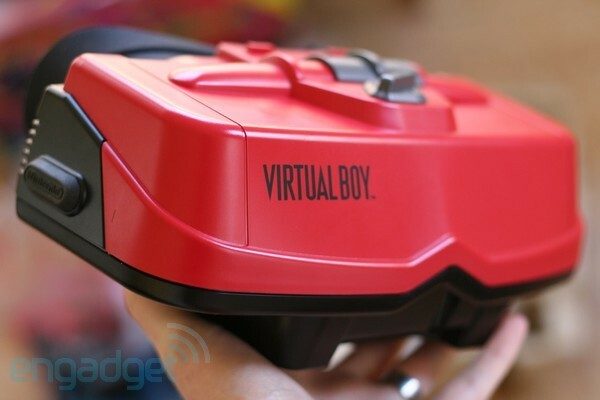 With the 3DS sitting now in back rooms of videogame and electronics stores nation-wide, waiting to spring into availability on March 27th, we thought this would be a good time to look back and give the Virtual Boy the full review it has always deserved but has never received. It's 3D!Comfortable controller...it's still 3D! The Virtual Boy is a bit of an odd bird, a fact immediately apparent as soon as it springs from its garishly colored box, cardboard that is perhaps compensating for what's to come. We've unboxed a number of classic consoles in our time, but none have looked quite like this. The system apes the design of the virtual reality headsets that were all the rage in the mid-'90s, but once you mount the thing onto its two-legged stand any aspirations of a truly immersive experience are obviously out the window. Any notions of shame will follow as soon as you stick your face in the thing. It has a red and black plastic design, some cheeky foreshadowing for players to be, and on the back is a foam-rubber shroud that ensures you'll be seeing nothing but what's coming out of the red-hued eye ports. There are two separate screens inside the Virtual Boy, one for each eye, but they're rather unlike your average display, starting with their resolution: 1 x 224. Yes, the displays are 224 pixels high and only one pixel wide. With a 90 degree rotation they'd be perfect for playing that Wolfenstein 1D port that came out a few months back, but obviously that's not how things are perceived by the human eye. A pair of oscilating mirrors scan back and forth, working much like the gun in a CRT to construct a full, 2D image. Since there are two of those odd displays, each with a different perspective, your eye puts them together to create a 3D effect. The ultimate resolution is 384 x 224, less than VGA but quite a bit better than the 256 x 192 the DS, DSi, and DSi XL make do with. These displays are powered by a 20MHz 32-bit NEC processor, the same one that powered the PC-FX, the successor to the TurboGrafx-16. That processor got by with a whopping 320KB of total memory, game data coming on 16mb cartridges that slotted in beneath the unit. It's enough oomph to create graphics that are slightly better than your average SNES title, but not nearly up to par with the N64 that was, ultimately, just about a year away. 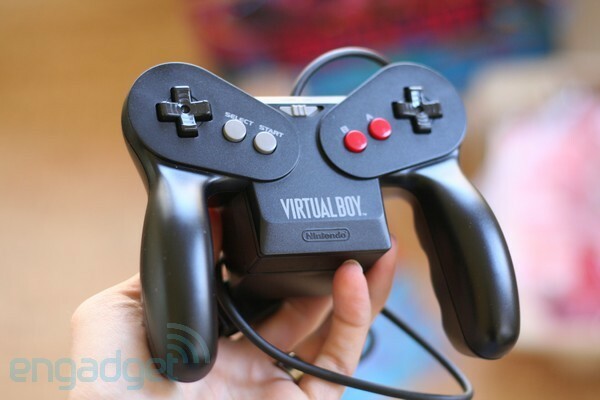 The Virtual Boy ships with a six-button controller offering dual D-pads. The idea was that these two would enable full 3D interaction but, in reality, they rarely did anything but mirror each other. It's a boon for lefties and ultimately appropriate given most of the games available for the system were simply 2D titles played on a couple of different planes. On the right you have A and B, on the left Select and Start, and then on the back are L and R buttons. It's a design that, in the hand, feels more like a GameCube pad than the one the N64 would receive. That's especially true thanks to its WaveBird-like backpack, but this one is much bigger, much heavier, and serves a totally different purpose. Six AA batteries slot in here, powering the entire system. Why Nintendo decided to slot all the batteries into the controller itself rather than the system is a mystery -- perhaps reducing weight so people could strap the system right to their head -- but either way your six cells are good for only about five hours of gameplay. Nintendo did offer an AC adapter, but it wasn't included, and it too attached directly to the controller. You kids today think having any cords on your controller is a drag. This thing has two! In our tireless effort to bring you the most comprehensive Virtual Boy review ever we acquired a library containing nearly a third of all Virtual Boy titles that ever saw release in the US. Unfortunately, to hit that figure we needed only four games, as a mere 14 carts hit US stores before promptly being relegated to the bargain bin, followed not long after by the system itself. Mario's Tennis - This is it. This is the game that launched the epic Mario Tennis series, a franchise that would go on to decimate the competition on the N64, GBC, GBA, and Game Cube in straight sets. It was also included right in the box, making it one of the last of the fabled pack-in games. A suite of familiar Nintendo characters lace up their tennis shoes, with Bowser being notable in his absence. It's fun enough to play, but the graphics are plain and hitting the ball ball seems to take more luck than skill, despite the 3D effect here. This game was meant to be two-player, but so few systems were sold that Nintendo never bothered to release a link cable. Doubles play, then, is right out. Galactic Pinball - This game greets you by saying, with an actual voice: "Welcome to Space World, let's go!" Digital voice was still somewhat novel in these days, what with only 16mbits of storage available. It's possible that one clip was enough to displace most of the other sound effects, because the pinball here emits nary a sound as it bounces around. Or, it could be because we're playing pinball in space, and in space nobody can hear your flippers. That also might go a long way toward explaining the decidedly other-worldly ball physics here. Vertical Force - This is a generally typical vertical shooter with a generally predictable catch: it can be played on two separate planes. You control a little ship that shoots lots of lasers and you must slice through wave after wave of enemy forces, which either appear on the higher or lower plane. You tap a button to cycle from one to the next, sometimes chasing bosses up and down and up and down. There's nothing earth-shattering here but, still, this is one of the more entertaining titles. Shame you can save neither progress nor high scores, though. Virtual Boy Wario Land - If there's a premiere title for this console, this is it. The Virtual Boy would be the only full-fat Nintendo console to never see a proper Mario title, this being as close as it would get. This basically a more aggro version of your average side-view platformer, with fish with chainsaws for noses and a viscious shoulder attack that sends enemies flying. Through the course of the game Wario has to wear a number of different hats, literally, one that gives him stronger attacks and one that puts a fire-breathing dragon on his head -- which looks rather too much like a sea horse to be very menacing. Naturally there's plenty of 3D parallax action here but you'll also face enemies and obstacles that attack from deep within the screen, and you'll occasionally need to send Wario back there too to find keys or open doors. It's worth noting that all of these games feature some sort of automatic pausing, a system that basically tells you to take a break after some period of gameplay. That's ostensibly to give your eyes a break, and it's a good idea to follow those recommendations. The Virtual Boy got quite a reputation as a headache-inducing machine but, while we certainly wouldn't say that our brains were completely immune to its effects, we didn't find playing games on the system to be all that bad. Of course, getting the mirrors aligned and focused properly is hugely important to the health and well-being of your occipital lobe. 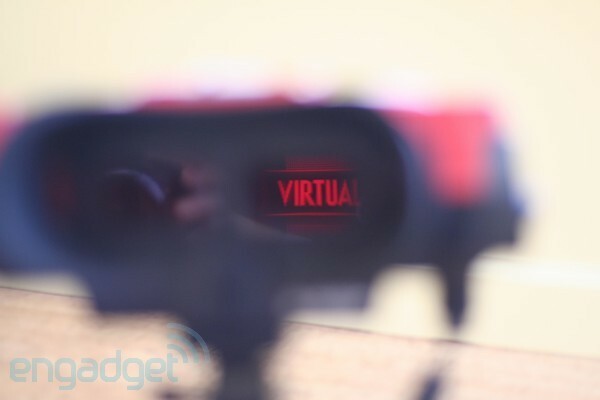 So, has history been kind to the Virtual Boy? No, but even compared to its mid-'90s alternatives the system just couldn't compete. It's a bulky thing, something that you have to hunch over a table to use and, while console gaming is rarely a social experience, you might as well put a sign that says "Kiss off!" on your back when your face is stuffed within this shroud. Of course, the real problem here is what's going on inside that shroud and, while the games themselves don't look particularly bad, the red and black displays just don't cut it. Remember, this console released four years after the SNES and, by the time it shipped, gamers were already gazing at tiny pictures of early N64 games in the latest issue of Nintendo Power. The simple, two-color displays here simply weren't good enough, and the 3D gimmick certainly didn't make up for it. 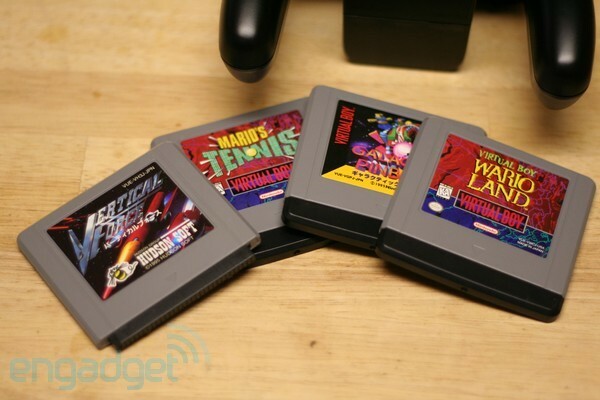 And of course there were the games, the majority of which were forgettable fare. It could be said that the system didn't live long enough for third-party developers to get up to speed, but there's really no point in pursuing that avenue of debate. 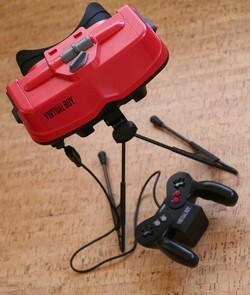 The Virtual Boy is a poorly-designed console that was rushed to market and then rushed to obscurity. Its place in history as one of Nintendo's biggest failures is well deserved, but as a novel addition to a retro gaming collection its position is well secured.